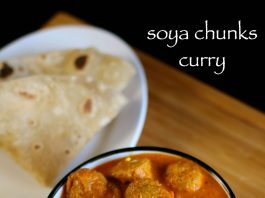 soya chunks curry recipe | soya bean curry recipe | soya bean recipe with detailed photo and video recipe. 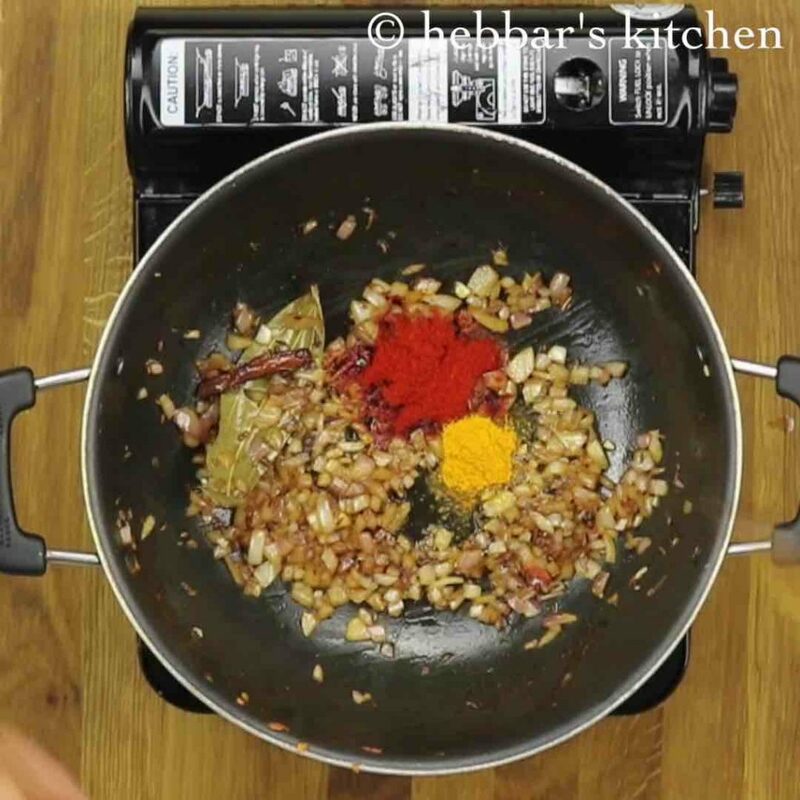 a healthy curry recipe with a good source of proteins for vegetarian lovers. soya bean curries can be easily served with roti, chapati, paratha and even with hot steamed rice. 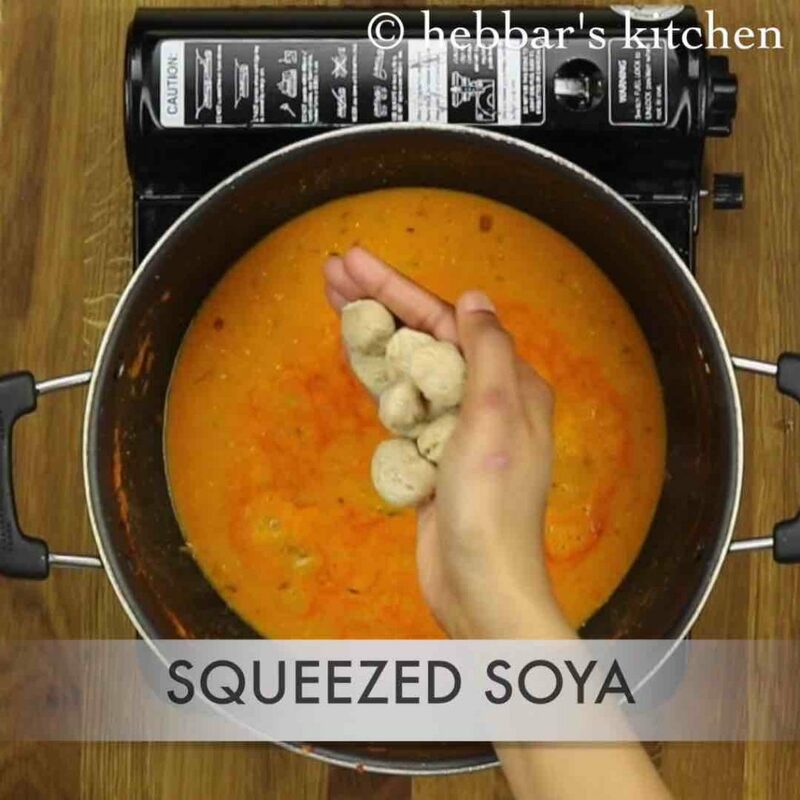 soya chunks curry recipe | soya bean curry recipe | soya bean recipe with step by step photo and video recipe. 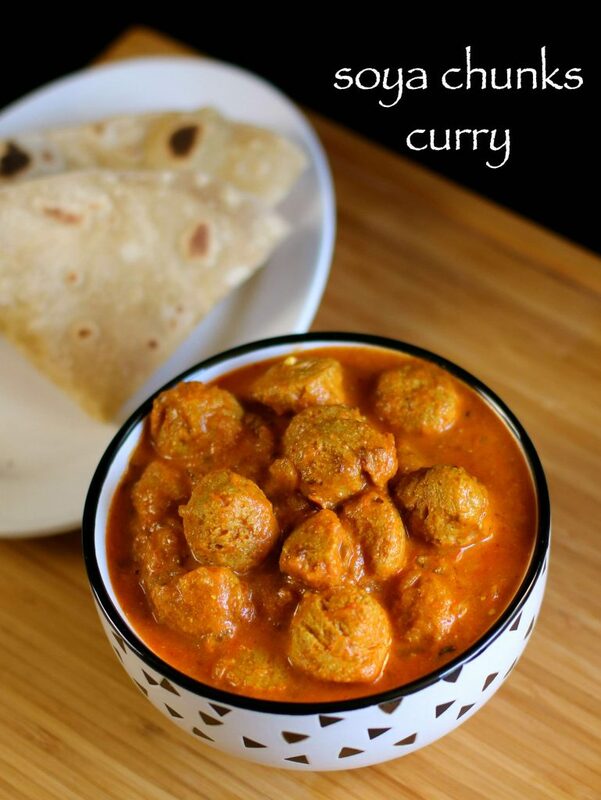 basically, a thick creamy curry recipe prepared with soya nuggets and other indian spices. 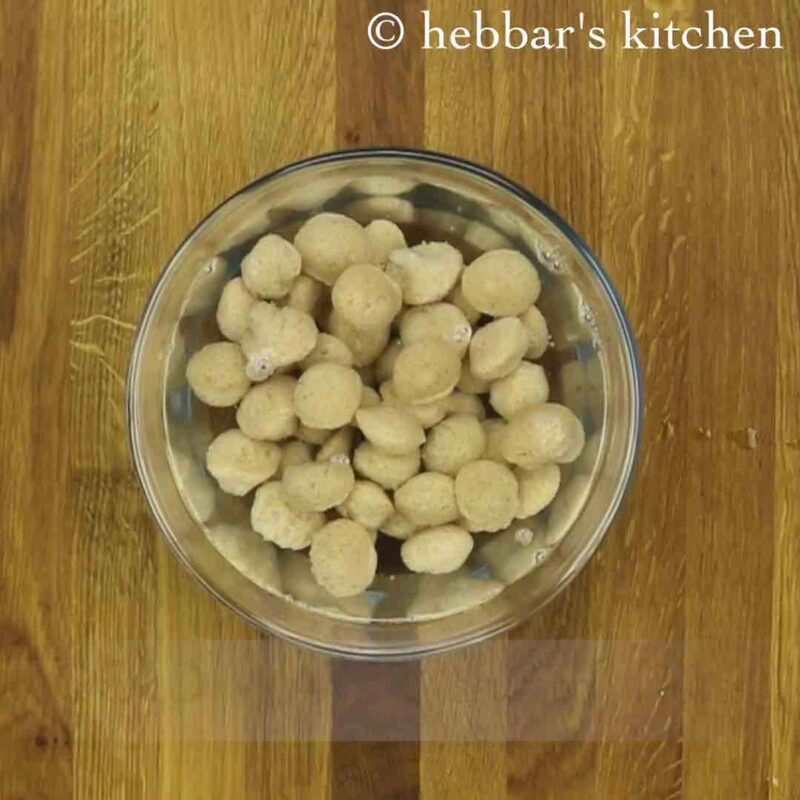 soya nuggets are the by-product of extracting soya bean oil. soya chunks are easy and quick to cook and turns to be juicy by absorbing the spiced curry. while i am not a big fan of soya recipes, my husband is a die-hard and ardent lover of soya chunks curry. to be honest, this is my first soya bean curry recipe on my blog after soya bean cutlet. and perhaps i am posting so late as i do not like. however, i was getting several requests for soya recipes and here we go. moreover, i wanted to prepare the soya bean curry recipe with additional vegetables like peas and potatoes. but later i decided to keep it simple and prepared with basic tomato onion gravy with spices. besides, soya has several health benefits and is highly recommended for vegetarians or non-meat eaters. as per the studies, soya contains a higher percentage of proteins compared to meat or egg. 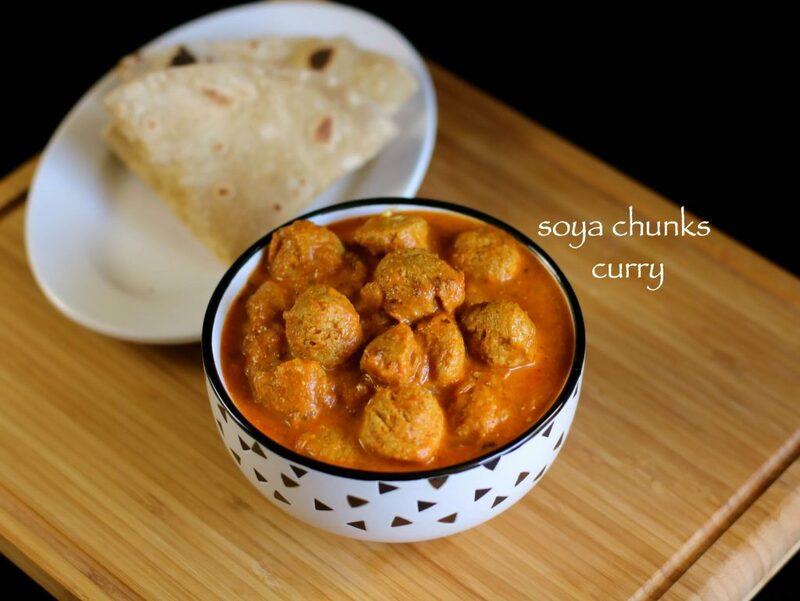 hence soya chunks curry can be an easy alternative to meat or non-vegetarian curry. secondly, soya bean reduces the risk of osteoporosis for menopausal women and also helps to overcome other menopausal disorders. lastly, soya nuggets are a good source of vitamins especially vitamin d and hence it is recommended for kids. 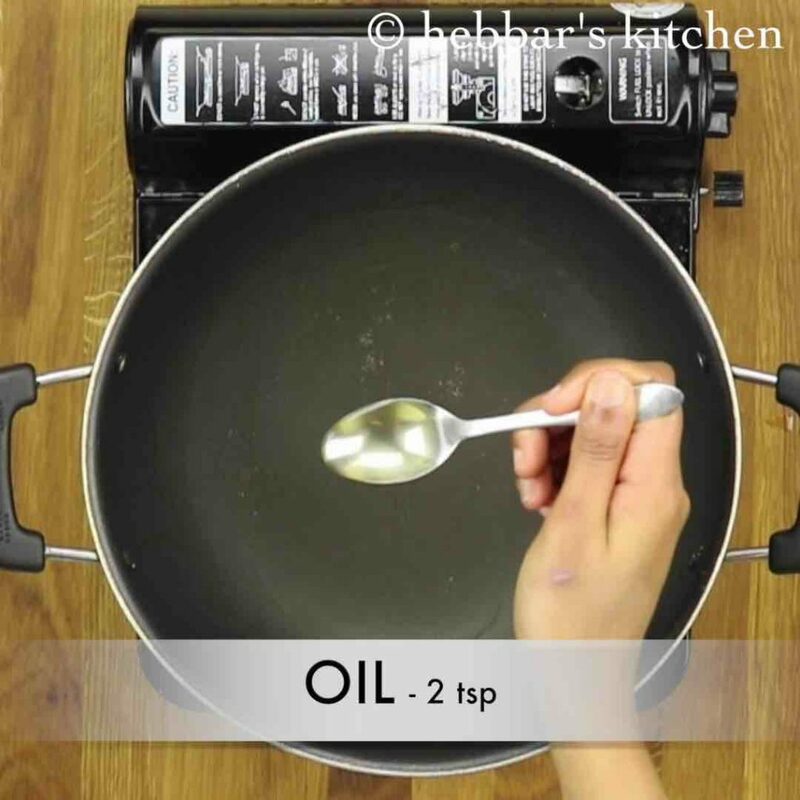 allow to rest for 10 minutes and squeeze completely. firstly, heat kadai and add oil and saute onion, ginger and garlic. also add tomatoes, cashews and saute well. further, add cumin, bay leaf, cinnamon stick and saute. then add finely chopped onions and saute. also add chilli powder and turmeric. 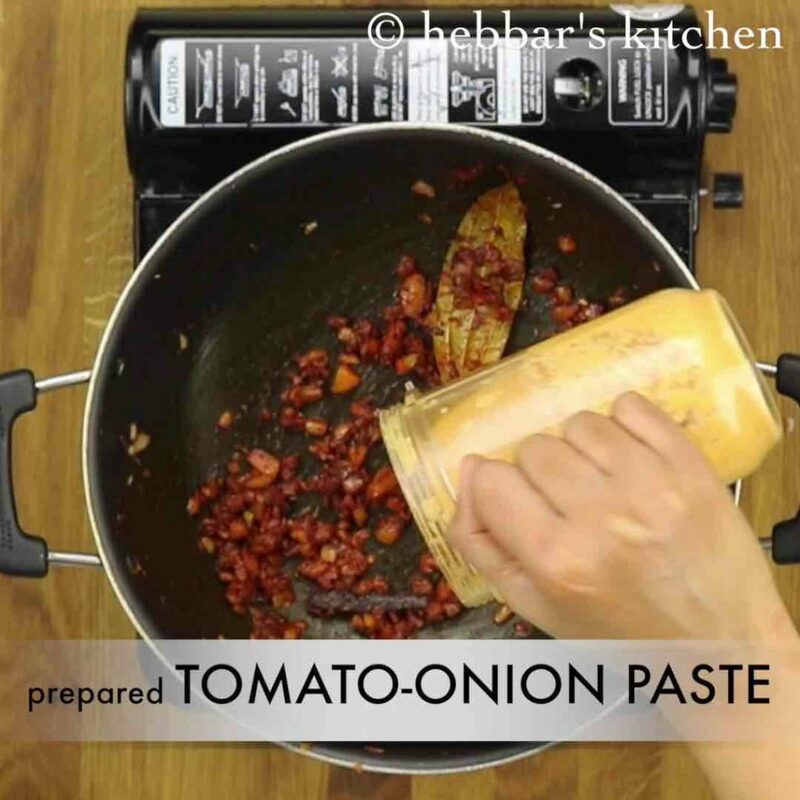 now add prepared onion-tomato masala paste and saute. additionally add coriander powder and salt. furthemore, add water and curd. mix well. now add squeezed soya and cover the kadai. 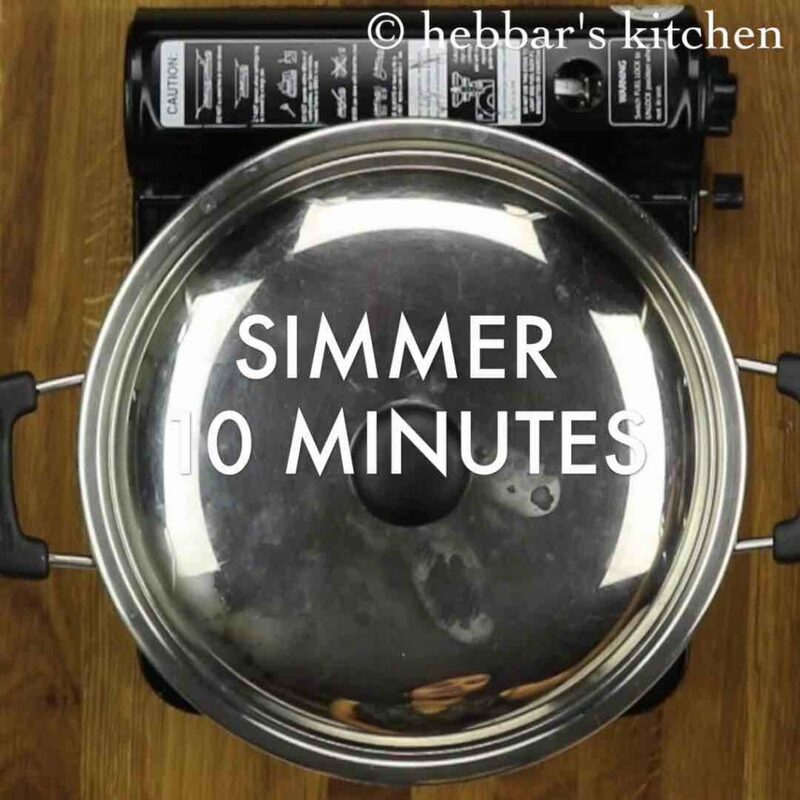 simmer for 10 minutes. later add kasuri methi and garam masala. finally, mix well and serve. firstly, in a large vessel take enough water and add in soya chunks. 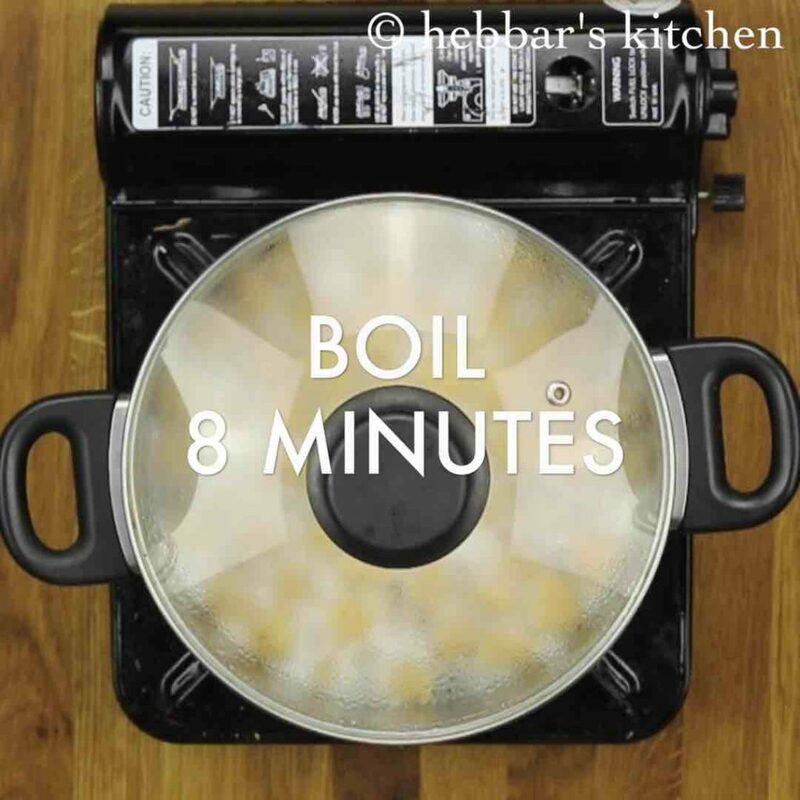 furthermore, cover and boil for 8 minutes, stirring in between. 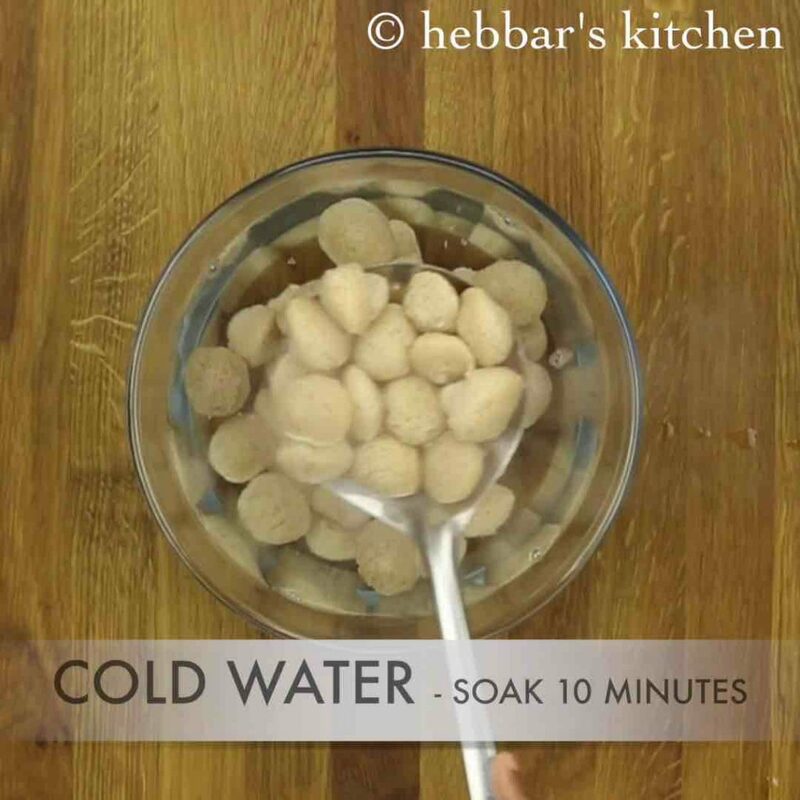 once the soya is cooked drain off the water and transfer to a bowl of cold water. allow to rest for 10 minutes and rinse multiple of times with clean water. further, squeeze off the soya chunks to remove the absorbed water and keep aside. 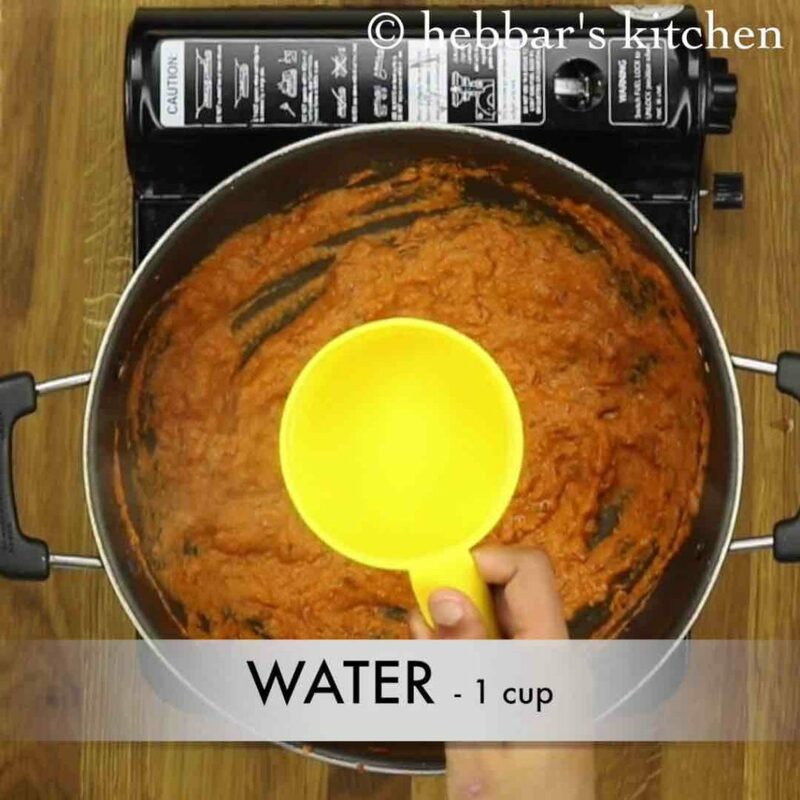 make sure to squeeze water else they wont absorb masala. firstly, heat kadai and add oil. 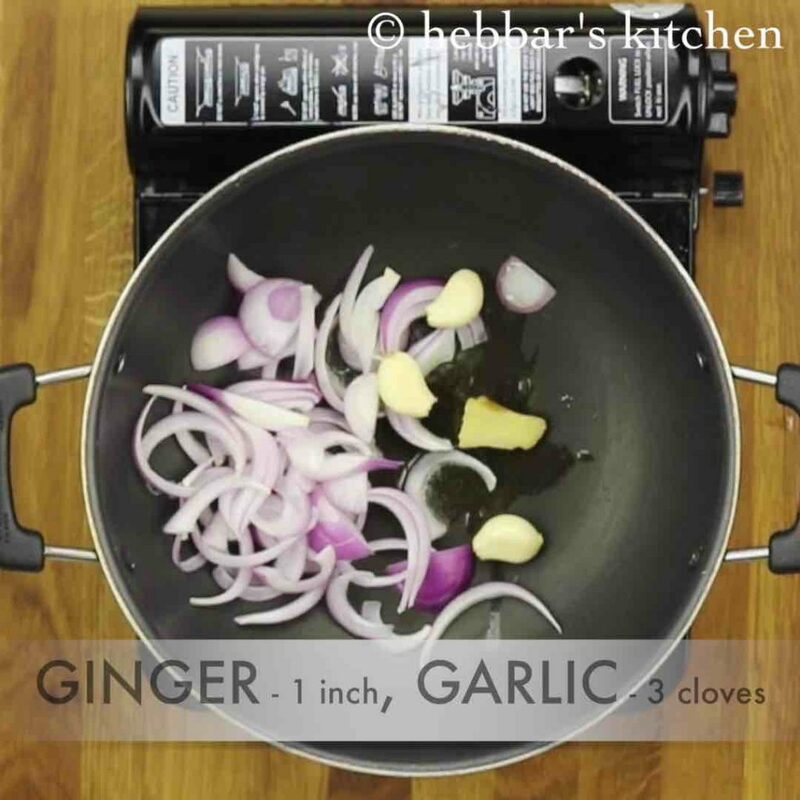 furthermore, saute onion, ginger and garlic till they change colour. also add tomatoes and saute well. 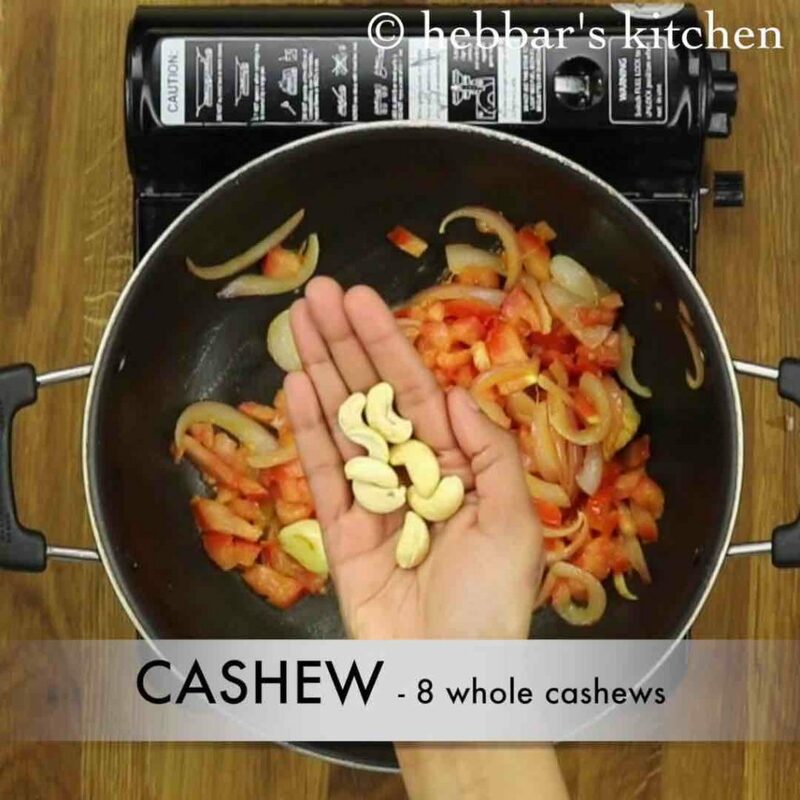 later add cashews and saute till tomatoes turn mushy. cashews make gravy thick and creamy. 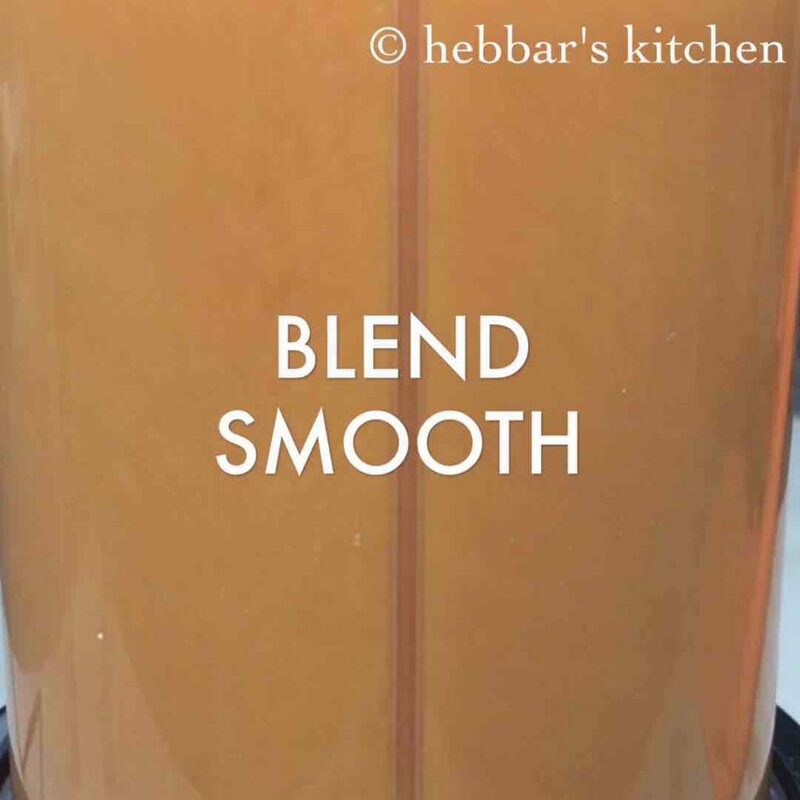 allow the mixture to cool completely and later blend to smooth paste. keep aside. 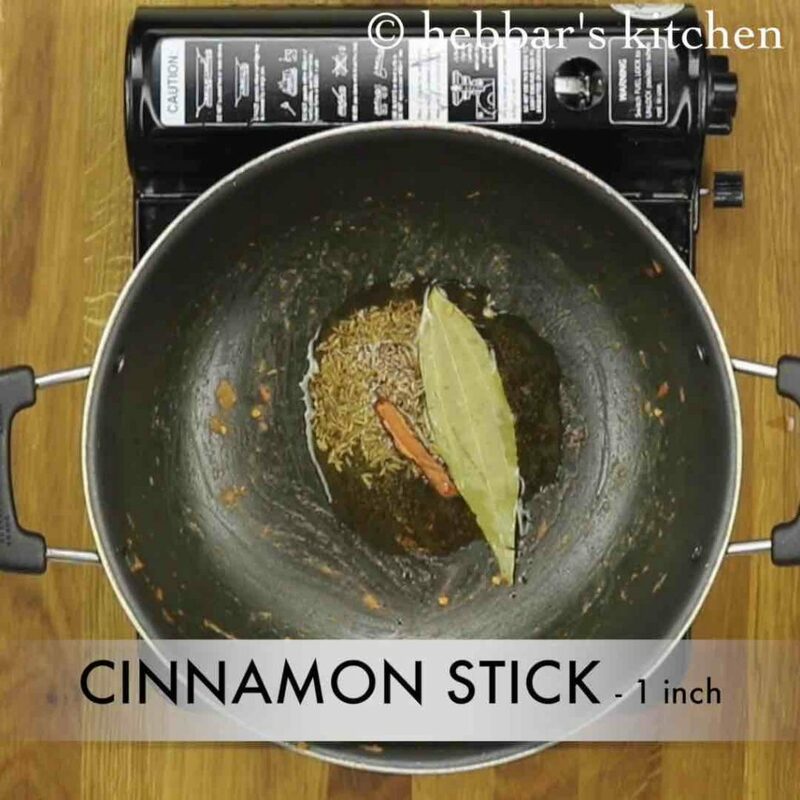 further, add cumin, bay leaf, cinnamon stick and saute till they turn aromatic. then add finely chopped onions and saute till they turn slightly golden in colour. also add chilli powder and turmeric powder and saute. 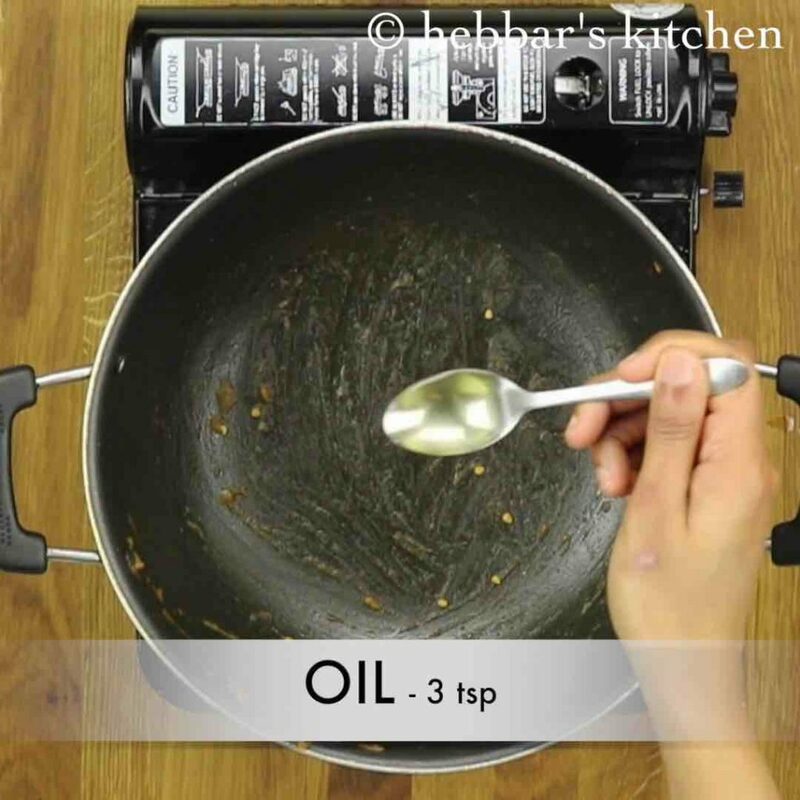 adding chilli powder directly to oil gives rich red colour. now add prepared onion-tomato masala paste and saute well. saute well for atleast 5 miunutes till the raw smell of masala goes away. additionally add coriander powder and salt. 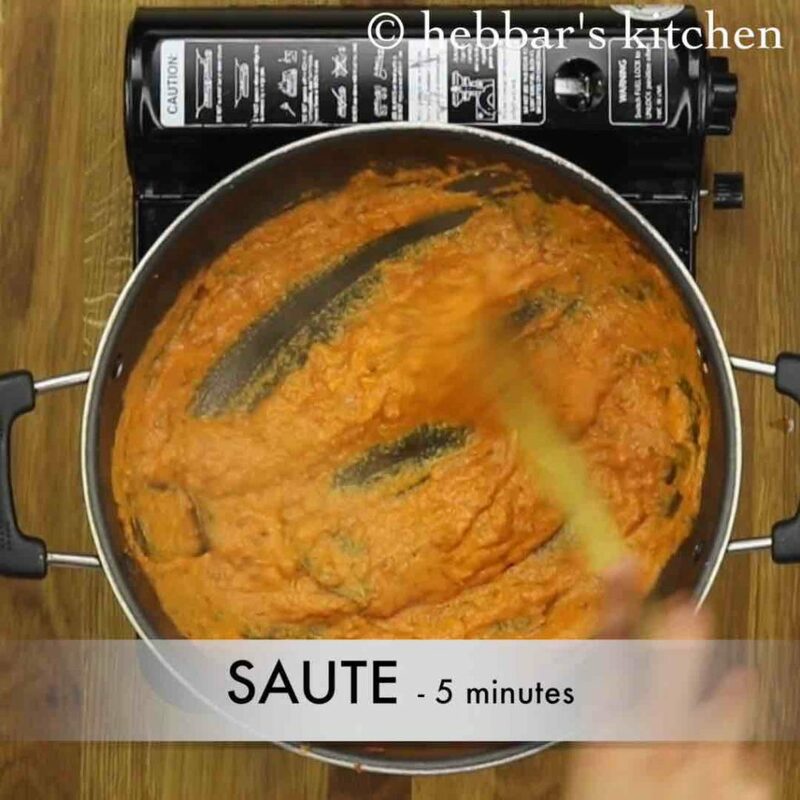 continue to saute for a minute or more. 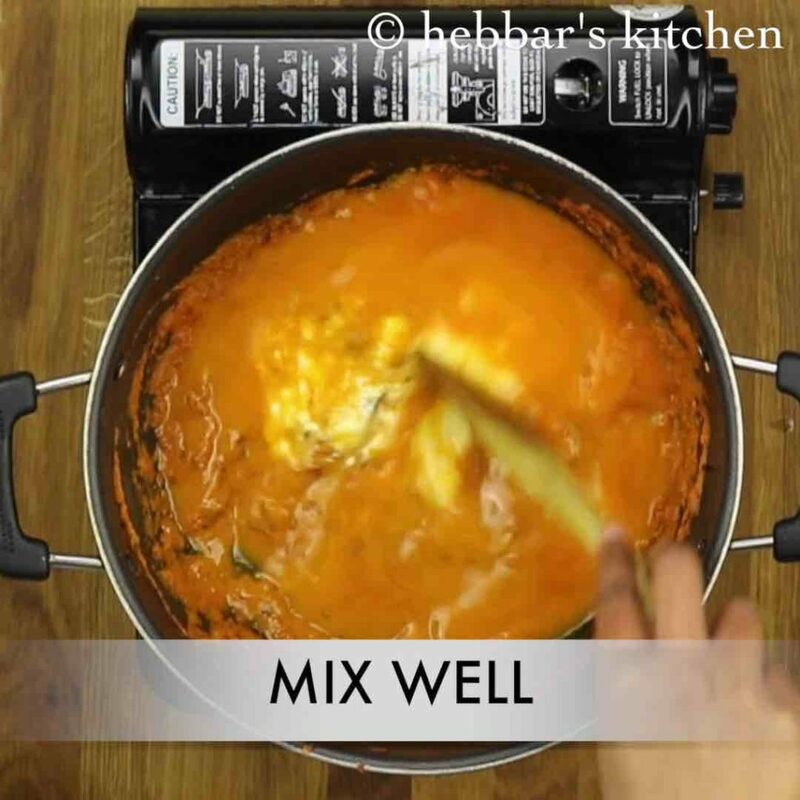 furthermore, add 1 cup of water or as desired to adjust the consistency of curry. 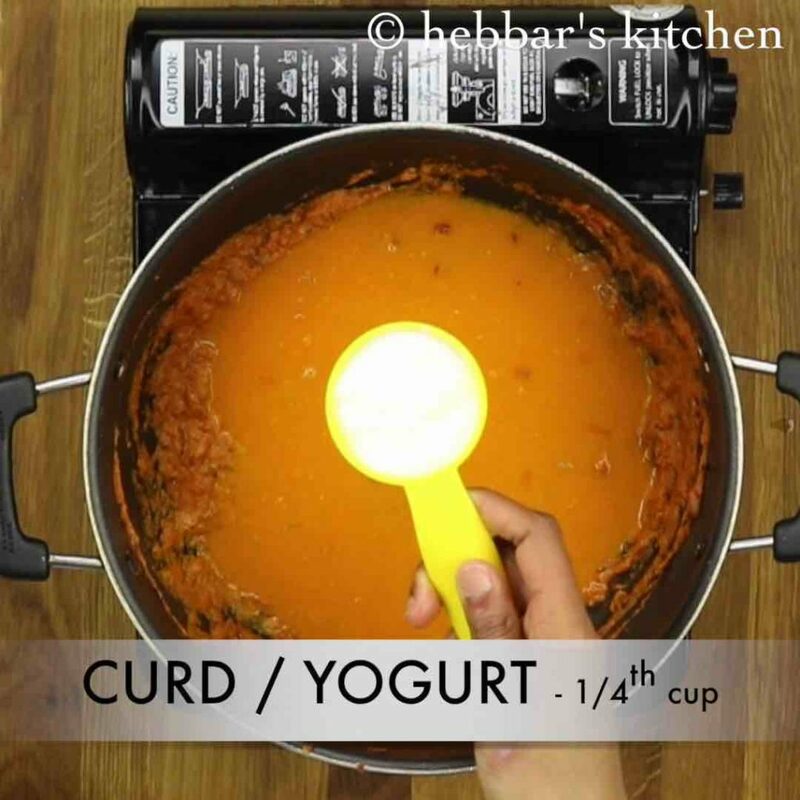 immediately add quarter cup of whisked fresh curd. make sure to lower the flame else curd might curdle. further mix well making sure the curd has blended well with masala. also add squeezed soya and mix well. 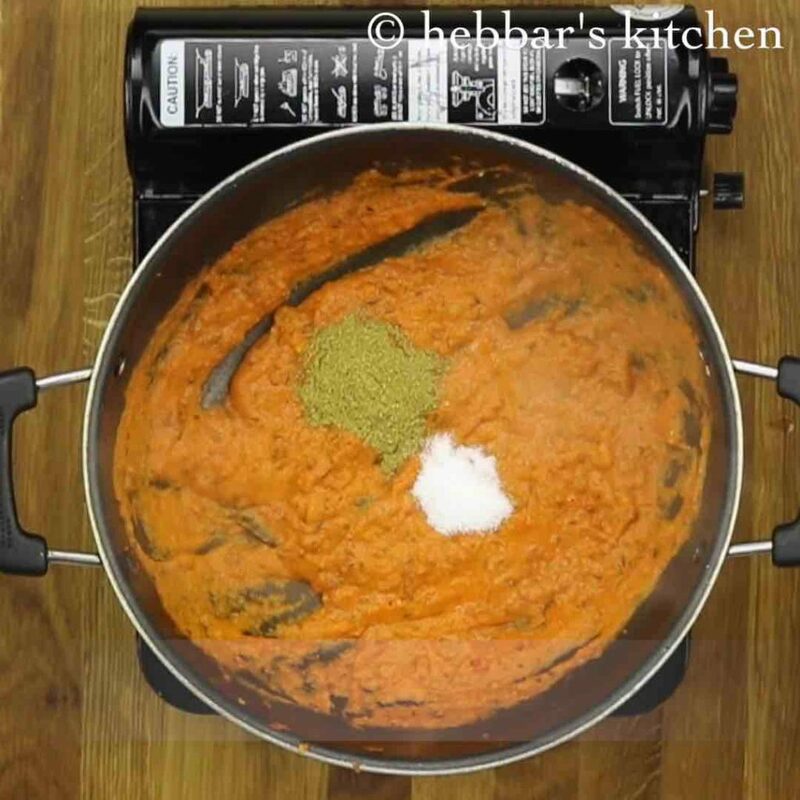 cover the kadai and simmer for 10 minutes. later add crushed kasuri methi leaves and garam masala. give a good mix. finally, mix well and serve with chapathi, rotis or steamed rice. 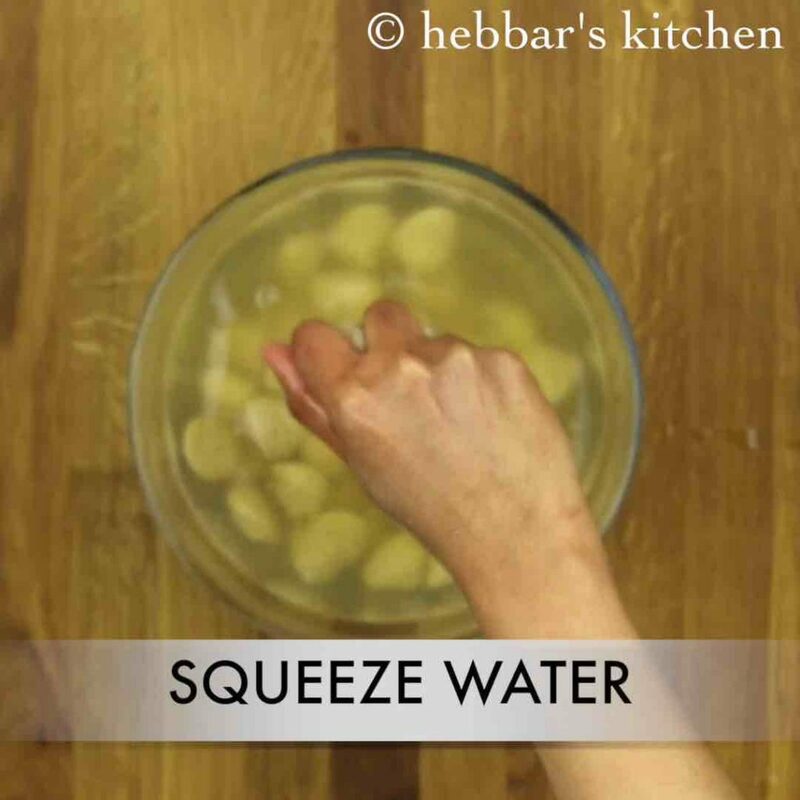 firstly, make sure to cook soya well and squeeze off the water. else they might be causing indigestion and smell bad as they are rich in protein. 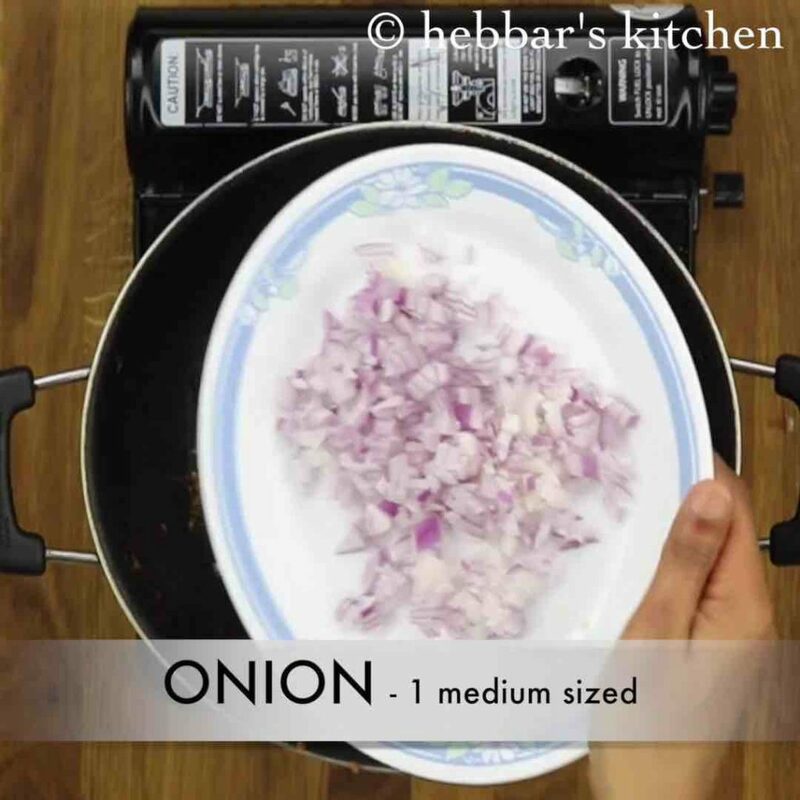 furthermore, cook the onion-tomato paste well to avoid raw smell in the curry. additionally, add a tbsp of milk while cooking soya to remove the smell from soya chunks. 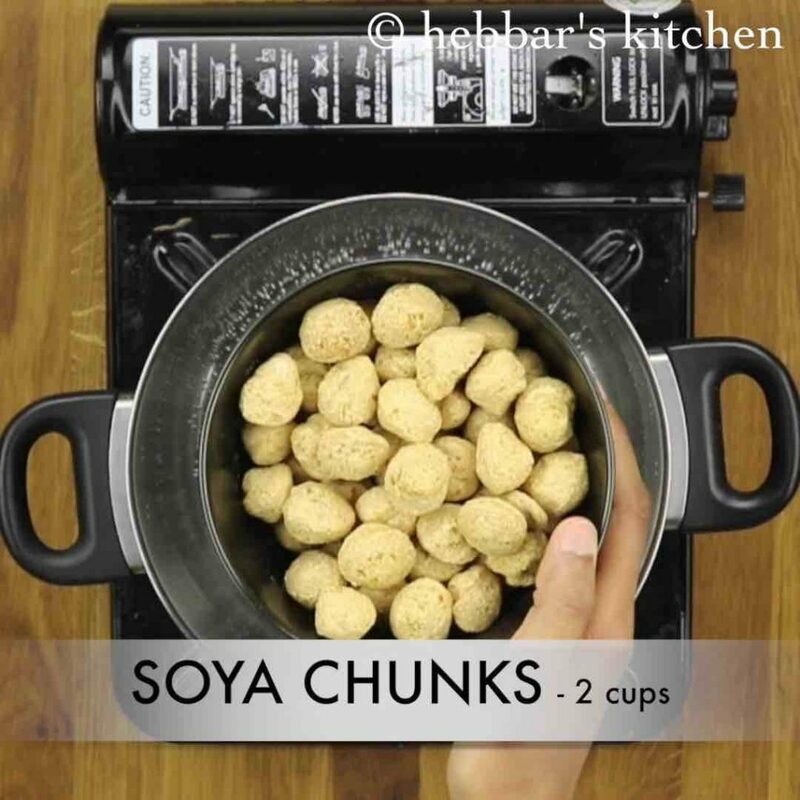 finally, squeeze off the water from soya chunks before adding to soya chunks curry. Some dishes I tried that came very well and it was delicious. All of ur recipes are just awesome..liked it soo much..
Just made this and it’s turned out awesome! 1st time with soya chunks and this is a very diff recipe. Can’t go wrong. Tumba thanks hebbars! Hi, I made this today and it turned out so well that my husband gave me Michelin 5 star. 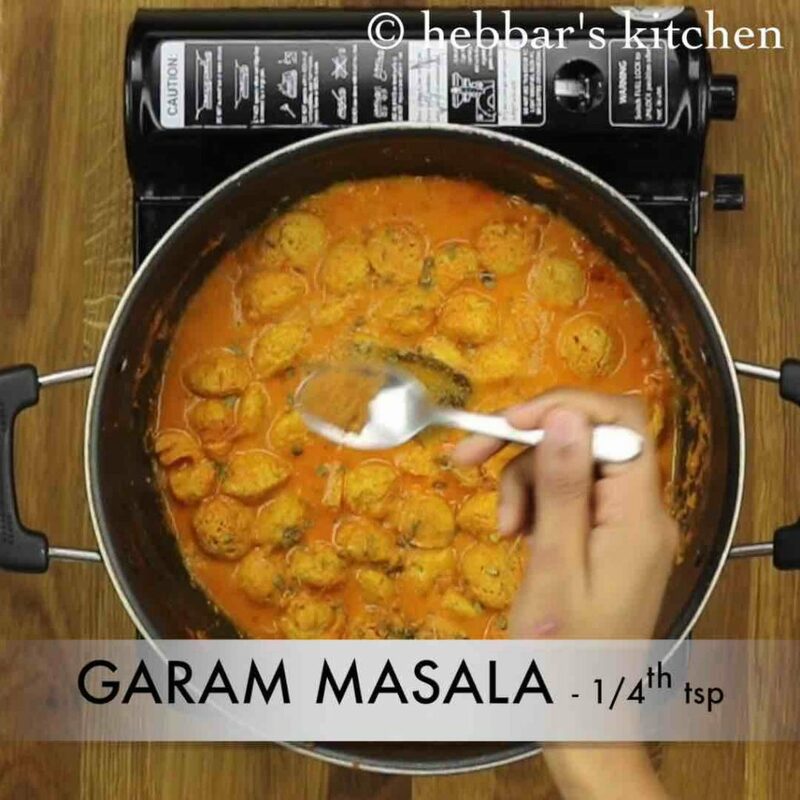 ☺️ Thank you for the recipe Hebbars Kitchen! I tried this. It was really awesome. I just loved the taste. I usually follow your recipes. 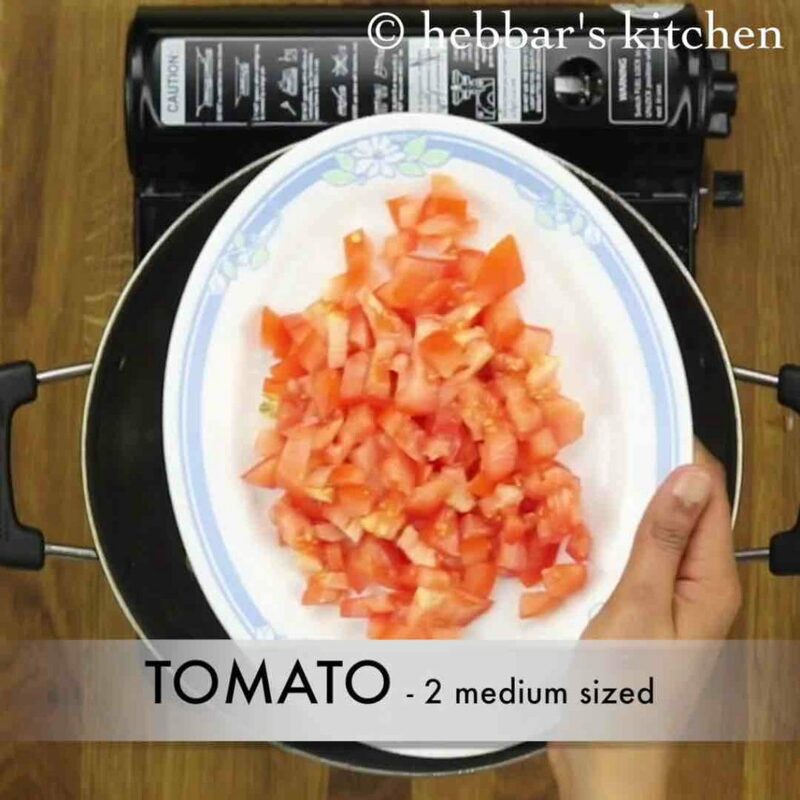 Thank you hebbars kitchen. thank you so much. it tastes yummm. why did u add garam masala in final step? It will create some raw smell in curry na? Radha, just a pinch would not give raw smell, but it gives a nice aroma to the curry. i always prefer to add it at the end. please share malai chaap recipe. I am unable to find it on your app. thank you! i will try to share it asap. thanks a lot for suggesting.